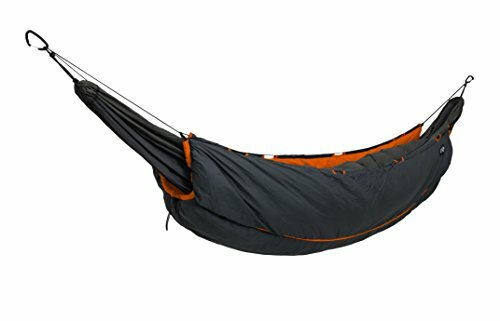 You've never been so warm in a hammock, period. For extreme conditions, the Vulcan UnderQuilt uses Primaloft Synergy continuous filament insulation for superior warmth and softness. The Vulcan's differentially cut construction adapts to the natural contours of the body, keeping drafts out and comfort levels up. The full-length quilt, complete with adjustable shock cord suspension, is thermally efficient, while its DWR finish creates a moisture resistant barrier. Packing down to a travel-friendly size in an included nylon stuff sack, the Vulcan also boasts incredible compressibility and a 35-45 degree (Fahrenheit) temperature rating when paired with a comparable top quilt. WARM UP IN THE WINTER: Made from the mega cozy Primaloft Synergy insulation and makes your hammock (not included) ready for all four seasons. Also has a temperature rating of 35-45 degrees Fahrenheit when paired with a comparable top quilt. MASTER THE ART OF LOUNGING: The Vulcan UnderQuilt has a differentially cut construction adapts to the natural contours of your body, keeping you cozy and snug. RAIN, RAIN, GO AWAY: This full-length quilt features a worry-free adjustable shock cord suspension, with a water repellent finish, keeping you dry all nap long. ADVENTURE READY: Weighing only 30 ounces, the Vulcan UnderQuilt includes a handy stuff sack, so you can take it on your backpacking adventure. If you have any questions about this product by Eagles Nest Outfitters, contact us by completing and submitting the form below. If you are looking for a specif part number, please include it with your message.